Irani was speaking at an event in Pune on Sunday. She also refused to elaborate on whether she would contest elections or not. “For the last hour, everyone wants to know whether I will be contesting from Amethi. But since the event is titled Words Count, in this case, Amit Shah’s word counts,” she was quoted as saying by a leading daily. 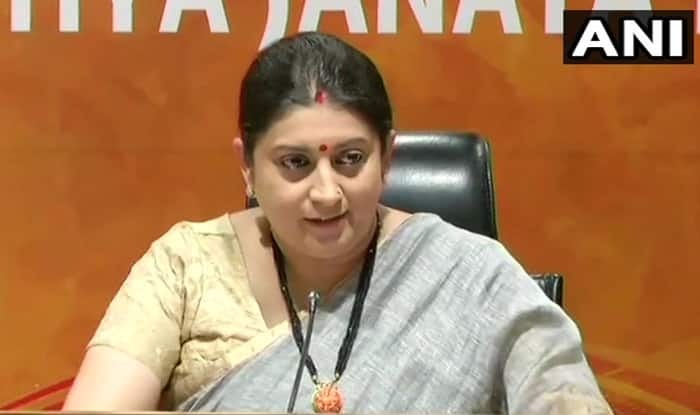 Elaborating on why she entered politics, Irani reportedly said, “I was very very lucky to work under a charismatic leader like Atal Behari Vajpayee and am currently serving under Narendra Modi. That was my ardent desire and when the Pradhan Sevak Narendra Modi decides to hang his boots, that is the day I will leave Indian politics,” she said. Referring to Priyanka Gandhi as Mrs Vadra, Irani said ours was an independent country and all were free to choose for themselves. Lauding her party’s role in supporting 33 per cent reservation for women, Irani said ticket distribution was based on the winnability of the seat. To a question about the SP-BSP alliance in Uttar Pradesh, Irani said that earlier also, when the ‘elephant sat on the cycle, it got punctured’.